We have completed construction of a working flying spot scanner camera using the RCA Photocell Cabinet. Visitors to the museum can see their friends as they would have appeared on mechanical television in 1930. Our goal was to make a camera that used that cabinet, and that looks like something that would have been made in the early 30s. Though we have one of the original photocells and the video amplifier that came with the cabinet, we decided to use a photomultiplier tube and a solid state video amplifier in our camera. There were two reasons for this decision: First, the original camera used an arc lamp for illumination, and had a total of eight photocells to collect the light. 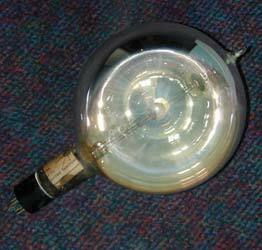 Our camera uses a 500 watt bulb, and we have only one of the photocells. It is unlikely that the output of the phototube would have a high enough signal to noise ratio to produce a decent picture. The other reason is that we intend to use the camera several hours a week, and we want it to be reliable. The light source consists of a 1920s lantern slide projector with a couple of 250 watt halogen bulbs installed in place of the original bulb. The scanning disk is about 24 inches in diameter, and was made by Peter Yanczer. A 1200 RPM synchronous motor is mounted above the projector, and an 85 mm f 2.8 camera lens was installed in place of the very long focal length lens that came with the projector. A 931 photomultiplier tube is installed in the top reflector of the photocell cabinet, surrounded by a black cardboard cover to hide all but the face of the tube. A 800 volt power supply was built in one housing, and a video amplifier, with a FET first stage, was built in another housing. These units are mounted in the rear of the photocell cabinet. The camera is used to televise visitors to the museum, so a plastic frame was built to show the subject where to place their face in order to be within the camera's range. The frame is located about 3 feet from the projector assembly and photocell cabinet. The photomultiplier tube must be shielded from other light sources, since they will create 60 Hz interference in the video. A heavy curtain is used on the entry to the room where the camera is located to keep the room dark. 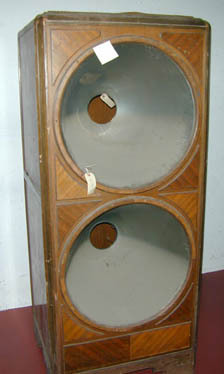 A coaxial cable connects the output of the video amplifier to a tube amplifier that produces about 40 v p-p to drive the RCA scanning disk receiver, located in another room. The camera produces a relatively good picture, with the subject recognizable to viewers. 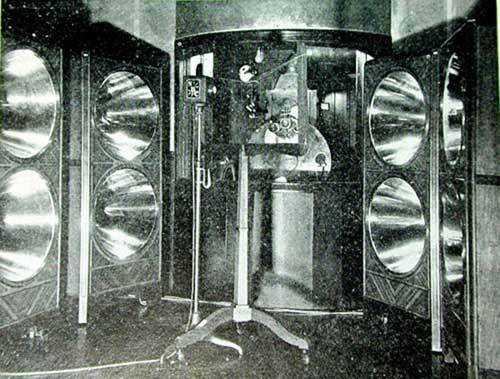 This is a cabinet used by RCA in their first tests of electronic TV. 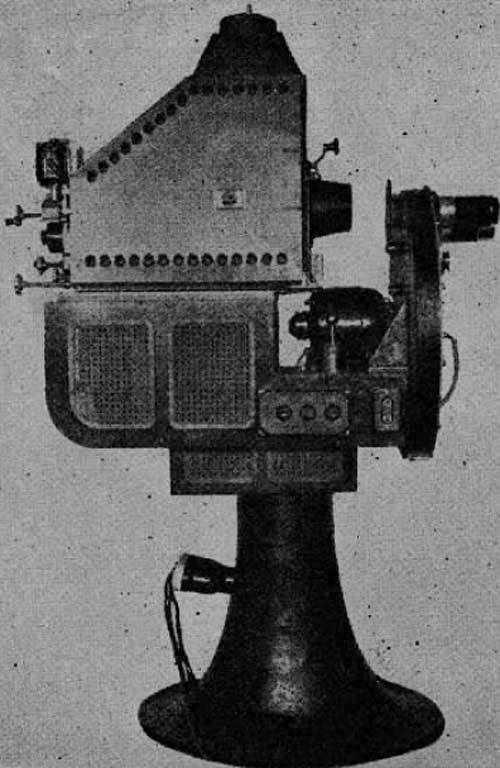 This camera was used by RCA in 1932 to produce a 120 line picture. 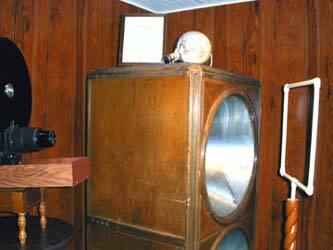 Though the camera used a mechanical disk to produce pictures, the receivers in the test were electronic, and had picture tubes instead of disks. Four of these cabinets were used in the camera assembly. Below is a picture of the complete camera as it was in 1932. The scene to be televised was in a darkened room. In the rear of the assembly is the light source, a high intensity arc light. Directly in front of that is the scanning disk. A lens focuses the light on the subject (Felix the Cat), which is suspended in front of the lens. The four photocell cabinets collect the light reflected off the subject. 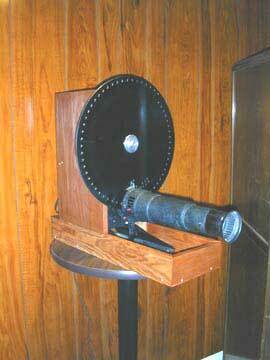 This is a closeup of the arc lamp, motor, disk, and lenses. Each cabinet contained two photoelectric tubes, which captured the light reflected off the scene and converted the light energy to electrical impulses. 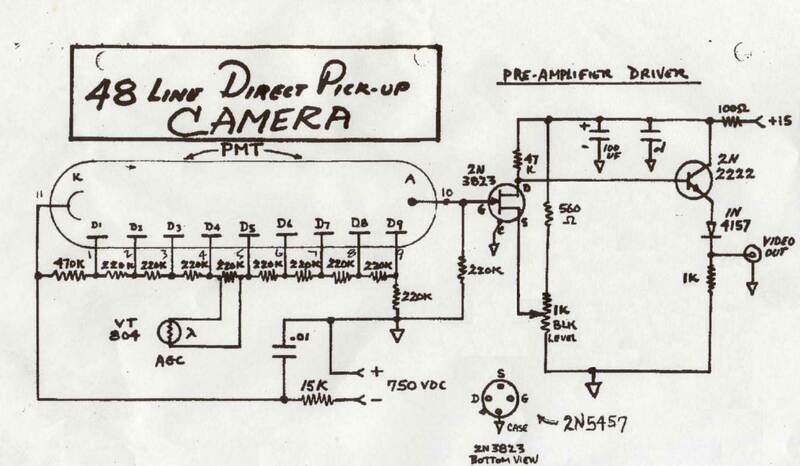 More pictures and information on the original camera can be found in this RCA article.